The story of introduced species in Texas is long (hogs were introduced by European settlers in the 1500s) and fraught with controversy. In Unnatural Texas? The Invasive Species Dilemma, Robin W. Doughty and Matt Warnock Turner introduce the “big hitters” of invasive species in the state. They profile the usual suspects—feral hogs, salt cedar, and fire ants—and also lesser known invasives, such as cats and sparrows. Blending natural and environmental history with geography, this book is a much-needed, balanced exploration of invasive species in Texas. The distinctions between native and invasive are not hard and fast, and perceptions of what is invasive have changed over the centuries. A striking example, free-ranging cats—domestic, stray, and feral—can wreak havoc on small mammal and bird populations. There is not a one-size-fits-all solution for invasives, and removal or complete eradication may not be possible or even desirable. The dilemma of what to do about invasive species also raises moral, social, economic, and cultural questions. 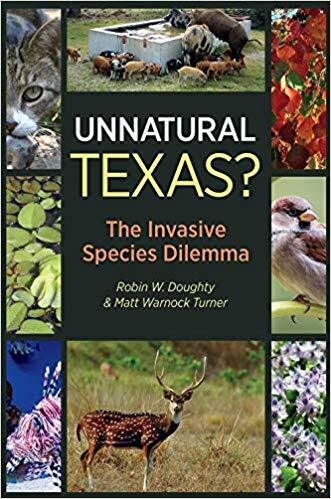 This engaging introduction to the concept of invasive species in Texas will provide context for readers and will educate people on this important issue facing the state.